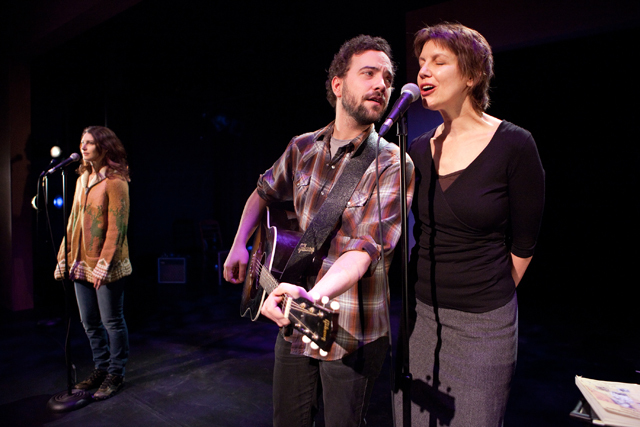 L-R: Liane Balaban (as Claire), Justin Rutledge (as Coop), and Maggie Huculak (as Anna) in Divisadero: a performance. Memories⎯like butterflies, eternal youth, and the Road Runner⎯are difficult to capture. They transform at an uncontrollable pace, jolt back and forth across years or miles, and while some moments remain painfully detailed, others quickly lose significance and accuracy. Memories can also be an evocative mode of storytelling, but to harness them properly takes a master of the written word, like Michael Ondaatje. A great example is the 2007 Governor General Award-winning novel Divisadero, which tracks the story of three adopted siblings across thirty years and from the California coast and France through various points of view. Necessary Angel‘s production of Divisadero: a performance, the theatrical adaptation of that novel, likewise embraces the use of memory as a storyteller, and ultimately feels remarkably like one too⎯a few moments of stunning, stripped-down clarity, but otherwise clouded by stretches of muddled haziness. Ondaatje’s personal style of prose of flashbacks and concurrent plotlines certainly makes for an engrossing read, but trying to transform it into two hours of live performance is a complicated and daunting task⎯which explains why it’s been over twenty years since one of his novels was adapted into a stage play. The process was long and collaborative: Ondaatje first approached alt-country musician Justin Rutledge about collaborating on a score for the play over three years ago, then joined forces with Necessary Angel’s artistic director Daniel Brooks to direct. Their efforts to bring Divisadero to the stage resulted first in a workshop in 2009 titled When My Name Was Anna. And finally, complete with an impressive cast of Rutledge, Liane Balaban, Maggie Huculak, Tom McCamus, and Amy Rutherford, Divisadero: a performance saw its first public performance at Theatre Passe Muraille on February 8. Justin Rutledge as Coop and Amy Rutherford as Bridget. The culmination of these efforts is necessarily simple⎯a bare-boned series of monologues, interjected with short interactions between the characters and live music. The play tells the story of Anna, Claire, and Coop—who each suffer the loss of a parent while children, and form a family under the care of Anna’s biological father—and their lives after a violent incident drives them all apart. The script relies heavily on Ondaatje’s words to drive the plot and develop the characters, mostly through the voice of an older Anna looking back at the dark events of her youth. The stark, black stage transforms into a variety of settings⎯a farm, a casino, a diner⎯in the minds of the audience, through the power of Ondaatje’s imagery. While the author’s fans may relish the descriptive language—and it is indisputably eloquent and captivating—Divisadero: a performance does illustrate why Ondaatje is a celebrated novelist, not necessarily a playwright. Anna’s narration dominates the script, and, as passionate as it is, fails to really convey the drama of the unfolding action. From behind a microphone, she describes her tryst with Coop, the brutality of their discovery, and the breakdown of Claire, Coop, and her father as a result, violating the classic “show, don’t tell” mantra. This has the effect of rendering the altercation between Coop, Anna, and her father—a crucial turning point that destroys the family’s relationships—underwhelming and slightly predictable. Anna’s retrospective also leaves her isolated from the other characters, as we hardly ever see her younger self (briefly played by Aviva Philipp-Muller) interact with Claire and Coop (Balaban and Rutledge, respectively). This may be a conscious choice, since Anna never reconnects with her clan after they go their separate ways yet remains a constant presence in their minds, but it leaves the characters’ relationships unclear. Her passionate romance with Coop feels arbitrary, the eventual fallout seems unwarranted, and the audience never really understands her, which is especially distracting since she is the main connection between the audience and the story. The amount of talent in the show is undeniable. First-time stage actors Balaban (from the filmsOne Week and New Waterford Girl) and Rutledge (whose latest album The Early Widows is nominated for the best Roots & Traditional Album of the Year: Solo Juno Award) are charming, Huculak and McCamus (as Coop’s card-shark buddy) show their expertise amid the heavy text, and Rutherford smokes as the Coop’s love interest, Bridget (and delivers an unexpectedly moving rendition of “London Calling,” too). With all these performers, and the legendary duo of Michael Ondaatje and Daniel Brooks at the helm, it would be hard for this not to be an enjoyable evening. Which, in the end, it is. But despite the crafted performances, reconstructed script, and music, the memory that persists after curtain call is one of an unclear family drama that would be better enjoyed curled up on a sofa rather than on its feet on a stage. Divisadero: a performance runs Tuesdays–Saturdays at 8 p.m., with PWYC Sunday matinees at 2 p.m., until February 20 at Theatre Passe Muraille (16 Ryerson Avenue); Tuesday–Thursday $25, Friday $30, Saturday $35.